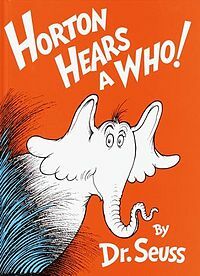 Tomorrow some of my colleagues and I will be paying visits to several members of Colorado’s national legislators in Washington, D.C. A story I read as a kid, and read to my kids as well, springs to mind: Horton Hears a Who, by Theodor Seuss Geisel. The book tells the story of Horton the Elephant (translate: state and federal governments) who, in the afternoon of May 15 (translate: June 7, 2011) while splashing in a pool located in the Jungle of Nool (translate: deficit ceiling, economic recovery, homeland security, political campaigning, ...), hears a small speck of dust talking to him. It turns out the speck of dust is actually a tiny planet, home to a city called Whoville, inhabited by people known as Whos (translate: people with intellectual disabilities) and led by a character known as the Mayor(translate: Imagine!, advocates, private providers, families, and friends). The Mayor asks Horton (who, though he cannot see them, is able to hear them quite well, because of his large ears) to protect them from harm (translate: program finance cuts), which Horton happily agrees to do (translate: remains to be seen), proclaiming throughout the book that "even though you can’t see or hear them at all, a person’s a person, no matter how small." In doing so he is ridiculed and forced into a cage by the other animals in the jungle (translate: contrary members of congress and state legislatures) for believing in something that they are unable to see or hear. His chief tormentors are Vlad Vladikoff, the Wickersham Brothers and the Sour Kangaroo. Horton tells the Whos that, lest they end up being boiled in "Beezelnut Oil," they need to make themselves heard to the other animals. The Whos finally accomplish this by ensuring that all members of their society play their part. (translate: and you know who you are) In the end it is a "very small shirker named JoJo" (translate: don't be this guy – add your voice to the chorus now!) whose final addition to the volume creates enough lift for the jungle to hear the sound, thus reinforcing the moral of the story: "a person’s a person, no matter how small." Now convinced of the Whos’ existence, Horton’s neighbors vow to help him protect the tiny community.